A day of drizzle did nothing to dampen the enthusiasm for Friday’s grand opening of the new wave shaper on the Nantahala River. It was the first major event leading up to the 2013 ICF World Freestyle Kayaking Championships and the World Cup of Freestyle Kayaking less than a year away — two events that will place Bryson City and the Nantahala Gorge on kayaking’s center stage. The playboaters above were demonstrating the wave for the grand opening crowd and will continue to practice their maneuvers over the coming weeks, providing feedback to the wave’s designers and engineers. The submerged high-tech structure has adjustable concrete components that allow fine-tuning of the wave’s flow pattern. The goal is to create a freestyle kayaking venue that will continue to attract the world’s top athletes for years to come. For more information, visit FreestyleKayaking2013.com. 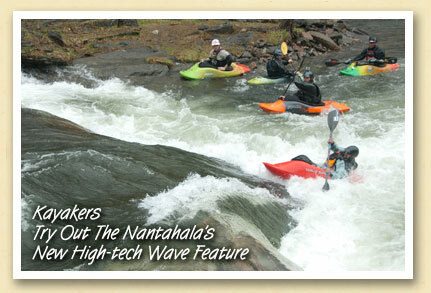 And for even more reading, check out the Asheville Citizen-Times’s great article on the Nantahala wave shaper.